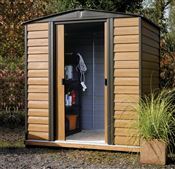 Galvanized steel garden shed Arrow WR series (replaces ED series) Wood Ridge model WR108 (Ex Garden shed Arrow ED0108) Galvanized steel imitation wood and brown. roof bases and beams in unpainted galvanized steel. Galvanized steel plate and door rail electrolysis. Electro galvanized steel for corrosion resistance. Available in 5 sizes to fit a variety of small and large storage needs. Double sliding door with large opening for easy entry and exit. Color in two shades wood grain and coffee to harmonize with most of the exterior of the house. Easy assembly with pre-cut and pre-drilled parts. Base size 307.3 xm x 235.6 cm. Door dimensions: 141 x 175.9 cm. Excellent produit mais la notice de montage n'est pas toujours simple à comprendre. Produit de bonne qualité.Montage assez facile en respectant les différentes étapes(il faut quand même être un bon bricoleur pour le montage)les différentes pièces sont repérées et marquer pour facilité le montage.Je recommande cet abri de jardin.Belle effet dans le jardin, il ce différencie des autres abris. Produit de qualité, le montage prends une bonne journée mais ça se fait bien à 2 voir 3 pour aller plus vite. Le manuel de montage est plutôt détailé mais parfois il faut relire une page 2/3 fois pour être sûr de ce qu'il faut faire (la traduction est bonne mais pas parfaite). Bon produit pour le moment ! Bon produit mais montage pas toujours évident malgré une notice bien détaillée. rapidité de la réception de la commande et très bon suivi de celle-ci. 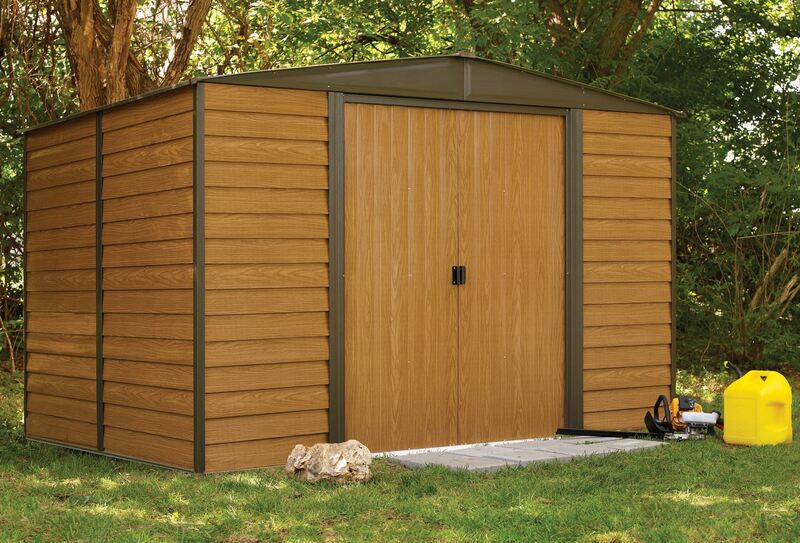 We guarantee that our outdoor storage buildings will not be damaged by perforation caused by rusting material. We will replace any part perforated by rust under normal conditions of use and maintenance during this period. This warranty does not cover surface oxidation that falls within the normal scope of use. ShelterLogic can not guarantee against the materials and treatments used a total guarantee against natural oxidation. The surface oxidation must indeed be the object of its appearance of a treatment as indicated in the manual of the owner. For your warranty to be in effect, the building must be maintained in accordance with the instructions in the manual. 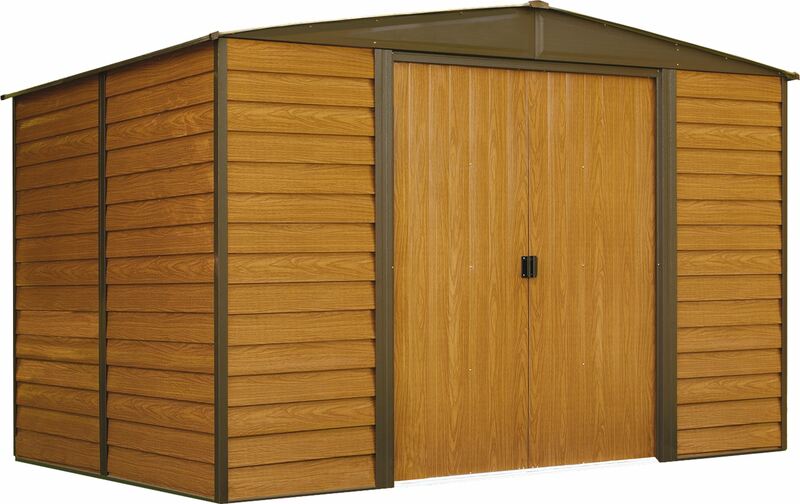 ShelterLogic Group warrants to the original owner that our outdoor storage products are free from defects in materials and workmanship. ShelterLogic will replace replacement parts that prove to be defective or missing.  Galvanized steel: Sheds and buildings in standard galvanized steel have a limited service life of 12 years.  HDG Steel®: HDG Steel Premium Sheds and Buildings have a limited service life of 15 years.  Vinyl coated steel: High quality vinyl coated galvanized steel models have a limited life of 20 years. Carports and other specialty products have a limited life of 10 and 20 years. 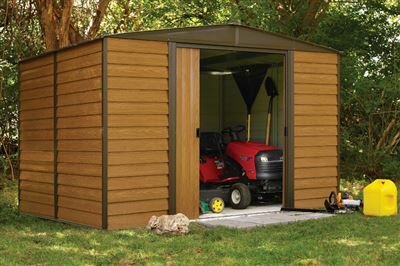 This commercial warranty only covers defects that occur during normal use and does not extend to color change due to weather, damage resulting from misuse or negligence, commercial use, failure to follow assembly instructions and owner's manual (including proper anchoring of shed or building), painting, forces of nature and other causes beyond ShelterLogic's control Group. The storage of pool chemicals and the use of pressure treated wood for the floor will lead to corrosion of the steel that can not be covered by the warranty. The warranty is void if the product is modified in any way. In no event will ShelterLogic Group be liable for incidental or consequential damages. A purchase receipt or other proof of the original purchase date will be required prior to the warranty. Under no circumstances will the seller pay the cost of removal of the product, cost of flooring, construction labor, or any other related cost.